Kilbeggan - blended whiskies as well as one limited release single malt; now beginning distillation at its own old distillery that had been closed for 50 years. Tyrconnell - non-peated single malts; In February I reviewed a delicious Madeira-finished juicy malt of theirs. The Tyrconnell had been one of Ireland's best selling whiskey brands in The States before Prohibition crushed it. Cooley bought the brand and resurrected it back in the late '90s. Greenore - single grain whiskey; actually made entirely from corn and aged in ex-bourbon barrels. 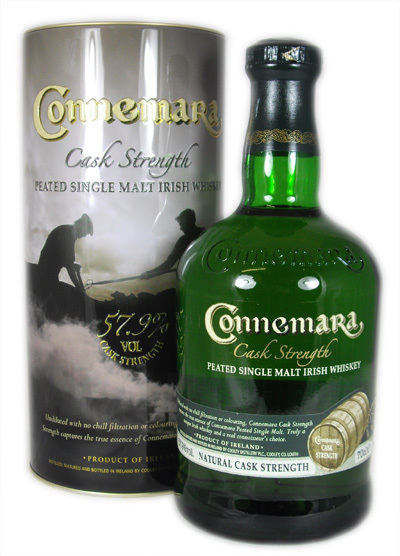 Connemara - peated single malts. As is done in many Scottish distilleries, they dry the malted barley via peat fires, give it a double distillation, then mature the spirit in ex-bourbon American oak barrels. They don't chillfilter, nor do they colour their product artificially. Within the world whiskey community, the purchase of the company by big Beam Inc. was met with mixed emotions. All of Ireland's major whisky producers are now owned by corporations. Pernod owns Midleton which makes Jamesons, Powers, Redbreast, Paddy, and Green Spot. Diageo owns Bushmills. William Grant & Sons owns Tullamore Dew. Cooley was the last of the independents to sell to a major, which led to many heavy hearts. But the good news is, with Beam's marketing and distribution power, Cooley will be able to get more whiskey to more people at (hopefully) a lower price to all. But how about the whiskey? I'm a big Tyrconnell fan. I hope to try some Kilbeggan before 2012 is out. Greenore is a mostly a curio for me since my palate hasn't found a corn whiskey it approves of, yet. And (via a Master of Malt 30mL dram) this Cask Strength is the first Connemara I've tried. The lack of added caramel colouring is immediately apparent, as the malt takes on a Pinot Grigio hue. All similarities to white wine end right there. This is an insanely hot whisky, flexing its almost 58% ABV braun in all categories. The nose reflects a different type of peat than the Islays -- sort of cleaner and woodier. But the band-aids are there, as well as an Atlantic Ocean note. Underneath that is a little brown sugar, bourbon, white peppercorns, and something a little meaty. It has a thick texture, which I quickly lost track of once the heat set in. As I mentioned before, this palate brings intense heat. It's a white sugar dish full of cinders and burnt paper. The malty cinnamon finish remains for ages. The nose became a big bushel of hay. Wood smoke, sweet cream, and bourbon settled underneath. The texture became creamier. The peat was most prevalent here on the palate, which held a nice light sweetness, but still had an aggressive cindery kick. The mouth-drying finish mellowed and held much of the peat and hay. I recommend this to single malt lovers with a strong palate constitution and a love of cinders, hay, and peat in the glass. Though I've become a major peat-head who's averse to fancy finishes, I actually prefer the Madeira Cask Tyrconnell to this one. But something good awaits within this malt. I'd like to try the regular 12yr 40% ABV Connemara to see if it reveals its flavors more readily.